FILE - Employees work at their desks at a Sina Weibo office in Beijing, China, Aug. 1, 2012. Launched in 2009, the Twitter-like microblog site, has been a digital megaphone for millions of Chinese to voice their views on a variety of issues, including a new quiz show critics say is laced with propaganda. The Chinese Communist Party is increasingly engaged in efforts to extend its propaganda reach, looking far beyond newsrooms and now spreading into an entertainment game show. But such blunt efforts to spread socialist theory are no longer always accepted as normal and this one has sparked a backlash online. 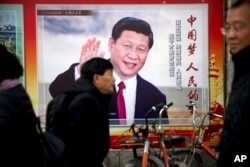 “Haven’t we had enough positive energy from [shows trumpeting the idea of] New China? Give me a break, these top [Communist] leaders!” one user complained on Weibo – the equivalent of Twitter in China – in response to the posting of a new prime-time program on Hunan TV – the second most watched channel in China. “The audience won’t like it. Let’s just wait and see the ratings to drop,” another Weibo user wrote. 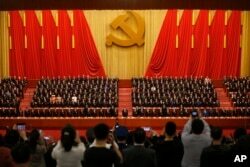 While some called the show “poisonous,” others took it lightly on Weibo, saying such displays of socialist doctrine have been common during the week-long National Day holiday in China. Since Sunday, Hunan TV, which is widely popular among the younger generation for its entertainment shows and dramas, has aired the first of its kind, five-episode show, titled "Studying Xi in the New Era." With its slick format, futuristic elements and the participation of young contestants, the show is the CCP’s latest effort to instill “Xi Thought” into the minds of young people, who have grown up more exposed to foreign influences than to Chinese socialist teachings, analysts say. “It is not a matter [of] popularity. It is about propaganda, it’s about how to let Xi Jinping appear everywhere, using a more entertaining way and a more-easy-to-get-into-your-home-television way to spread Xi Jinping Thoughts,” said Bruce Lui, an award-winning former reporter and currently a senior lecturer of journalism at Hong Kong Baptist University. The show, he added, also puts an end to the low profile that Xi sought to keep earlier out of concern that some might blame him for triggering the U.S.-China trade dispute. The network’s spokesperson did not answer VOA’s repeated calls for comment. Since “Xi Thought” was added to China’s constitution in March, a wave of campaigns to study the theory has been rolled out across the country among local party chapters, schools and universities, on state media and even in churches. But whether the campaigns including the latest game show have achieved their desired outcomes is in doubt. “In most cases, news media are unable to change viewers’ stance. More often, they can only reinforce their existing views. In other words, those who welcome it (Xi Thoughts) will look out for such shows to watch while those who don’t, may find it unacceptable,” said Xu Huiming, an associate professor of journalism at Guangzhou University. The quiz show and a recent outburst by a state media reporter in London has showed that, as China’s profile in the world grows, it has turned even more aggressive in spreading its socialist way of thinking both at home and abroad, Lui added. She was briefly arrested on suspicion of assault after allegedly slapping a conference volunteer, who asked her to leave the event on eroding freedoms in Hong Kong under Chinese rule, according to a video clip circulated on the Internet. The incident has highlighted the differing views toward the role of journalists in China, said professor Xu. FILE - Journalists take pictures of Chinese President Xi Jinping, front row center, and other Communist Party officials at Party Congress at the Great Hall of the People in Beijing, Oct. 24, 2017. Journalists in China are educated to serve the party, says a journalism professor of at China's Guangzhou University. Xu said that makes them appear more like government propaganda workers than journalists representing a free press. Lui said many in China who have an uncensored understanding of what Kong did on Sunday would agree that her behavior was unprofessional and irrational, although her outburst has won her acclaims and vocal support among more nationalistic Chinese netizens operating in an environment of censorship. He added that China’s increasing aggression has posed a serious threat to Hong Kong’s long-honored freedom of press and speech as discussion grows on the territory’s future. Political debate on one-party rule is now considered a taboo.